Raw food diets are great for puppies. When it comes to nutritional content, freshness, and taste, no commercially available kibble can compare to raw food. This is especially useful for young puppies that need to take advantage of all the nutrition they can get. To ensure that your dog grows into a happy and healthy adult, you need to plan your pup's diet accordingly. Puppies grow up very fast and have unique dietary requirements. It's important that you stay on top of their development and body condition as they grow. There's a fine line between providing them with too much raw food and not enough. 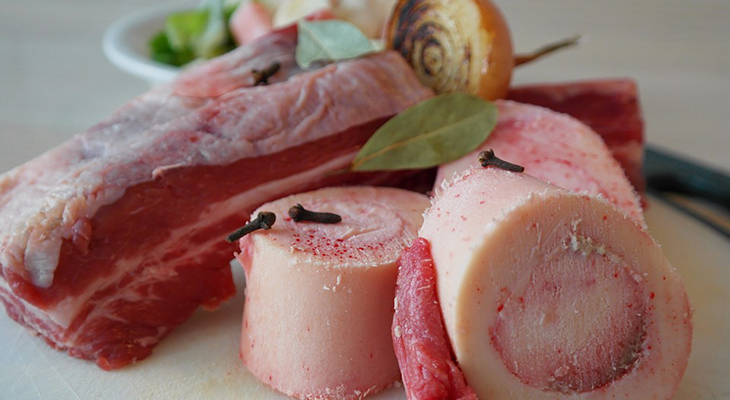 The quality of your puppy's raw food will directly affect their bone, organ, and brain health. While the dietary needs of a puppy aren't drastically different when compared to an adult dog, there are some things to consider when planning meals. Protein is the foundation of muscles. It's the single most important thing that dogs need. Because puppies are first starting to develop muscles, they need a bit more of it than adults. At the very least, your puppy's diet should be made up of about 22%. However, more protein is always welcome. You can add more protein to your pup's diet as long as it's not causing excessive weight gain. This is a significant jump from the minimum requirement of 18% for adult dogs. When you're planning a raw diet, go with a protein source that's a bit fattier than normal. The best option is to use proteins that have healthy fat, such as fish. Fish has omega fatty acids that can benefit your dog's entire body. Not only does it keep the skin and fur healthy, but it can also make sure that your puppy's brain is developing properly. Puppies need a diet with about 8% fat. Calcium is responsible for bone development. It typically comes from the meat source, bones, and cartilage. Your puppy's food should be made up of approximately 1% calcium. While this may not seem like much, most adult dogs only require about 0.6%. It's important to be careful with calcium. You should never add supplements to raw food. In most cases, the calcium in the meat is enough to provide your dog with their daily requirements without going overboard. Too much calcium can lead to abnormal bone growth. Phosphorous is another essential nutrient that works alongside calcium to build bones. You'll need to make sure that meals have about 0.8% phosphorous. Like calcium, that daily requirement will likely come from the meat source. When Should You Start Feeding Your Puppy a Raw Diet? It's best to start feeding your puppy a raw diet as soon as possible. You can avoid many common gastrointestinal issues by starting them off on raw food. Usually, you'd have to follow a transition plan if you're making the switch to a raw diet. However, if you have a puppy that's never consumed dry kibble, you can skip this step entirely. Most puppies start to wean off their mother's milk at about 3 to 4 weeks of age. Because raw food is naturally soft and easy to digest, you won't have to worry about any additional preparation steps. Your puppy's soft palate will have no problem chewing up the food immediately. How Much Raw Food Does a Puppy Need? Figuring out how much food to feed your puppy can be tricky. Despite their small size, young dogs will need a significant amount of food to stay healthy. Furthermore, their tiny bodies will need refueling much more often to keep up with the development cycle. To many, the first thought is to just provide an endless supply of food. Commonly referred to as free feeding, this method ensures that puppies always have access to food whenever they need it. While this may work for some dogs, the idea is generally not recommended. Puppies can gain weight quite easily. They do self-regulate their consumption to some extent, but weight gain is a very real threat. The nature of raw food is another thing to consider. Raw food can become contaminated the longer its left out. This can put your new puppy at risk for a wide variety of bacterial infections and diseases. So how do you go about planning their meals? 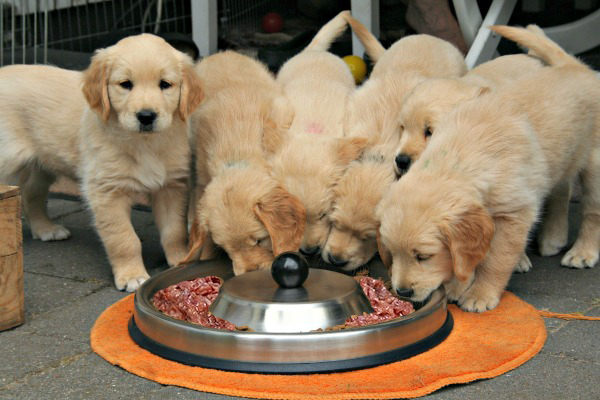 The preferred method for planning puppy meals is to go by their weight and age. The process involves some calculation, but it's the best way to make sure that your pooch is getting the nutrition they require. To accurately determine meal sizes, you'll have to keep track of your puppy's weight on a regular basis. It's important to note that puppies gain weight very fast. They can double or even triple their weight within the first couple of months alone. As a result, you'll need to continually modify meal sizes accordingly. Meals should be measured in weight rather than volume. Throughout the first year, you should be feeding your puppy between 3% and 10% of their overall body weight each day. To figure out the amount for your particular puppy, you would simply multiply their current weight with the decimal of the recommended percentage. For example, say you have a 12-pound pup that needs 8% of their weight in food each day. Your calculations would be: 12 x 0.08 = 0.96 pounds. 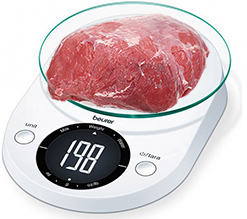 The calculation works with pounds, kilograms, and grams. Feeding schedules and weight calculations should be used as a starting-off point. There are a number of other factors to consider when planning a meal. Not every puppy is the same, therefore, you'll need to adjust based on the particular needs of your pooch. Some of these factors include activity level and body condition. If your dog is very active, they'll need a bit more food to compensate for the calories they burned while they exercised. The same goes for puppies that tend to lounge around. Luckily, many puppies will regulate this factor themselves. You may notice that they leave some food behind if they don't need it. Body condition is an important thing to take into account. You should keep track of how your dog is carrying their weight and figure out quantities from there. If your puppy is looking a bit underweight, provide a bit more food to help them pack on the pounds. If they're overweight, hold back to help them get back on track. It's impossible for your puppy to eat up to 10% of their body weight in one sitting. You'll need to split up their daily requirements up into multiple meals. Adult dogs do well on only two meals per day. However, newborn puppies that are still feeding off their mothers will eat many times each day. It's important that you work your way down to two meals. It's recommended that you start off with four meals each day and slowly decrease frequency until your pup is an adult. This first stage of development will begin once your puppy has gotten off their mother's milk and last to approximately four months of age. It's recommended that your puppy eats 8% - 10% of their body weight each day, depending on their activity and body condition. This amount should be spread out between four meals. During this stage, it's a good idea to start out with minced white meats. This included chicken, turkey, and fish. You can also provide them with large bones to chew on. This will help during teething. However, it's important to give them large bones that can not be fully chewed or swallowed. At this point, you should be feeding your puppy between 6% and 8% of their body weight each day. You should also decrease the frequency of their meals down to three each day. This is also a great time to start introducing other types of food. You can provide red meats like beef, pork, and organs. Most puppies are also capable of chewing bones. Your puppy will require 4% - 6% of their body weight in food each day. This is also a great time to start thinking about going down to two meals each day. There's no exact time when this should happen, so you'll need to keep an eye out on your pup and determine if it's a good time or not. If it's not, you can continue with three meals until the next phase. By now, your puppy should be significantly larger than when you started. They're getting closer to adulthood, so they'll only need between 3% and 4% of their body weight in food each day. You should also go down to two meals a day so that they're adequately prepared for their normal routine as an adult. Once your pup has reached a year of age, they're more or less an adult. Some breeds will continue to grow beyond this point. However, the growth rate is much slower. You should be sticking to a normal feeding routine of two meals each day.